For over 9 years, Alice 105.9 has been a proud partner of Children’s Miracle Network and The Children’s Hospital. The Children’s Miracle Network is an International a non-profit organization dedicated to raising funds and awareness for children’s hospitals. It encompasses 170 premier children’s hospitals treating more than 17 million children each year. All funds raised locally are used locally. In these 9 short years, Alice listeners have raised over 9.0 million dollars. Alice’s 36 Hours for Kids is a one-of-a-kind radio Marathon embraced by the Denver community that continues to grow each year. This year proved to be no different. 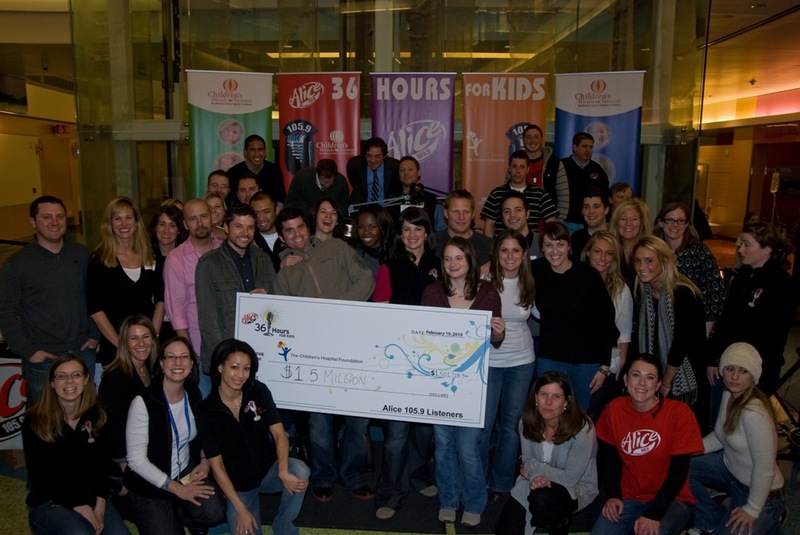 In February 2010 Alice 105.9 broadcasted live for 3 days from The Children’s Hospital, asking loyal listeners for generous donations to help families and children affected by illness and disease. Our Radiothon consisted of heart wrenching stories told by children and their families, miracle moments of happy endings, great Alice DJ banter and compelling interviews – all in support of a great cause: The Children’s Hospital. This year we raised over 1.5 Million dollars.